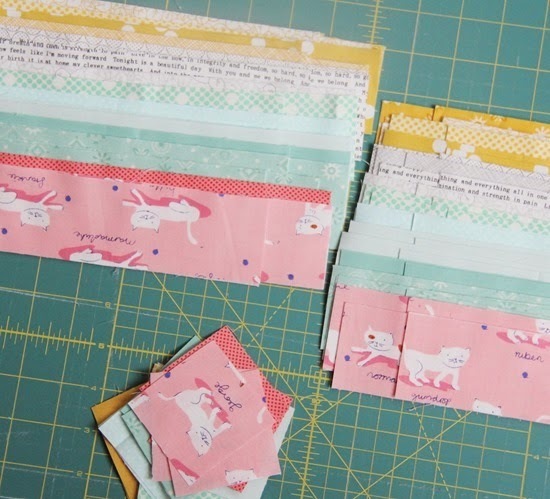 After stealing away time here and there to sew the past week I have a pretty stack of blocks! These will be a Twin size quilt for Sophie. This quilt was a big fat pain to cut out because I wanted so many fabrics in it, but after cutting it went together quickly with chain piecing. This block makes a perfect Twin size quilt (66” x 88”) if you make 48 blocks, 8 rows of 6 blocks each. Here’s a quick diagram of the sizes to cut your strips if you ever want to make it! Again these are the cut sizes…not the sizes after sewing! The center is a 2 1/2” square and the rest of the strips are 2”. I could get all these pieces plus some extras out of 2 strips 2” x width of fabric” (except the 2 1/2” square). My first thought, nice and bright! perfect for spring. Great looking, thanks for sharing the measurements- can I ask though how much fabric would I need? Would a FQ pack and a yard of solid pull this off? This is going to be beautiful! Thank you for sharing the measurements of the block pieces. So pretty and fresh looking with the pale solid colors and little fussy cuts. Your daughter is going to love it! My head hurts just thinking about all that cutting! It is absolutely beautiful … it just shouts "spring." Beautiful colours – this will be a gorgeous quilt. Your timing is perfect since I'm just about to launch into my first Courthouse Steps quilt. 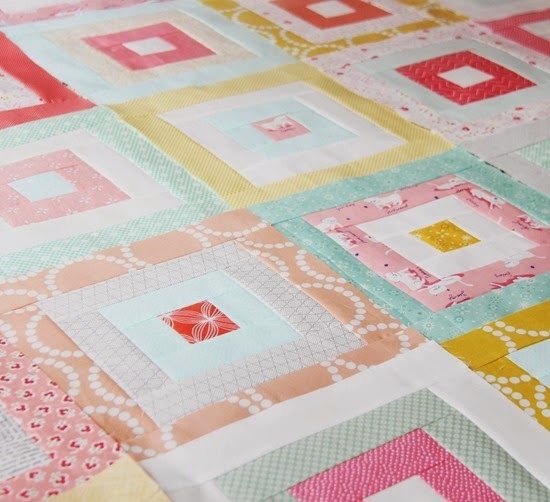 This gives me a good idea how it will turn out although I'm using jelly rolls so my blocks will be a bit bigger. I couldn't face all that cutting!! Thank you so much for sharing the dimensions. Your colors are wonderful. Love the kitty center. Makes me want to do one with all fussy cut centers. Just lovely. Great idea to use a 2.5 center then 2 by cuts. It really makes the centers pop! How sweet are those blocks! Hope we get to see the finished quilt ~ it's going to be adorable! This quilt is beyond precious! She's going to love it. Oh those colour combinations are just gorgeous – the perfect combination of pink without being all out Princess! Looks fabulous thanks for sharing. This quilt is beautiful! Love all the colors! The colors are just perfect! You do such awesome work and I thank you for the measurements! You are a treasure. Great colors ~ so cheery for a little girl! Thanks for all the measurements! love the colors and your fabric choices! I look forward to seeing the finished quilt and I know your toddler will just love it. Turning out to be such a cute quilt! Love it! So lovely colors! My daughter looked at your photos, and she loves the pink fabric with whit cats, the aqua (her favourite color at these times)… Nice work! Beautiful! You did an excellent job on it!!!! I can't wait to see the finishing quilt! Such wonderful colors, just beautiful! I just love the beautiful colors in this quilt, and the "cat – fabric" is adorable! Lucky Sophie :) Thank you so much for sharing the measurements of the block! 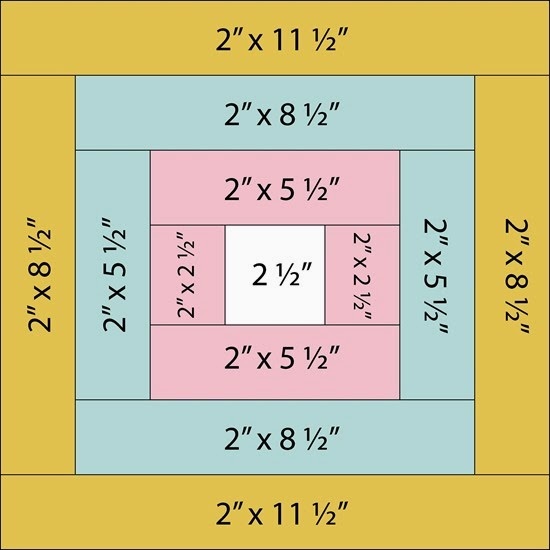 Hi, This is lovely and as a new quilter I really appreciate your diagrams and measurements. 'horsey' quilt I had when I was small. It had adorable appliqued rocking horses on it. I loved it until it was in shreds. I wish my mother had saved those shreds for me, but, alas, she threw them out. Hopefully, today's new fabrics will last longer than my beloved horsey quilt. I'm hoping my grandchildren's quilts last many happy years. So beautiful! What pretty colours too. Sophie's a lucky girl. So pretty. I love the colours you've used 😊 so pretty! If I was just choosing fat quarters any idea how many I'd need? 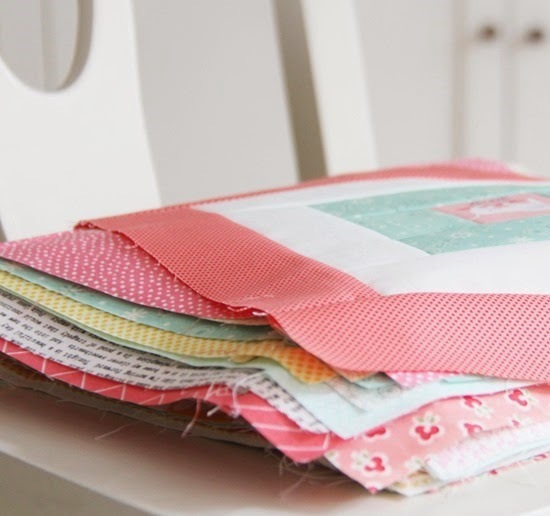 But WHY a big fat pain, compared to other quilts you've done? The fussy cut kitty is darling. those colors and the little framed kitties are so cute! I love your fabric choices! Thank you for sharing. This is adorable! Love your variety of fabrics! Love the quilt and it just shows that even if you have only small windows of time how much you can accomplish. P.S. I believe this is not a true Log Cabin, but an adaptation called Courthouse Steps.